The situation around a Gyumri IT development program is clearing out: as it turns out there is both an operating program and a Closed Joint-stock Company under the same name. On Thursday at a meeting with reporters the head of the Enterprise Incubator Foundation Bagrat Yengibaryan explained the situation. 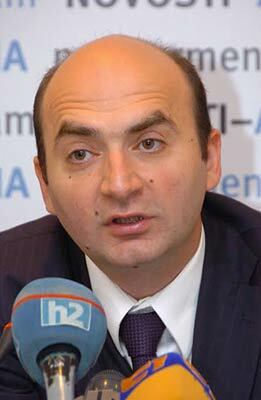 The fund headed by Yengibaryan in January of this year was entrusted with management of the Gryumri Technopark program. The reason for the confusion was that after the company’s foundation in 2006, in 2008 the government adopted a concept of turning Gyumri into a techno-city (in which a technopark program was the most important component), which was supposed to cut down disproportions between Yerevan and other regions, to improve the business environment, to solve the main socio-economic problems of Gyumri. However, the Gyumri Technopark company, where the state had a 49-percent stake in the form of property, was not included in the Gyumri technopark program because of its limited power and lack of possibilities to grow. At the same time, the technopark program, for which the state budget had allocated 700 million AMD ($1.7 million), according to Yengibaryan, is very promising and has already attracted various foreign investors. “What took place in Gyumri is a surprising result our neighbors cannot even dream about,” he added. The Gyumri technopark program has always been a target for criticism during the recent years, and until now many people do not quite believe in its success.